What Do the Irish Call Grandfathers? There are a few terms for grandfather in the Irish spoken language, known as Irish Gaelic, although, English is spoken predominantly in Ireland, so, one of the most common names for grandfather is "granda." The Irish word for grandfather is seanáthair, literally meaning "old father." 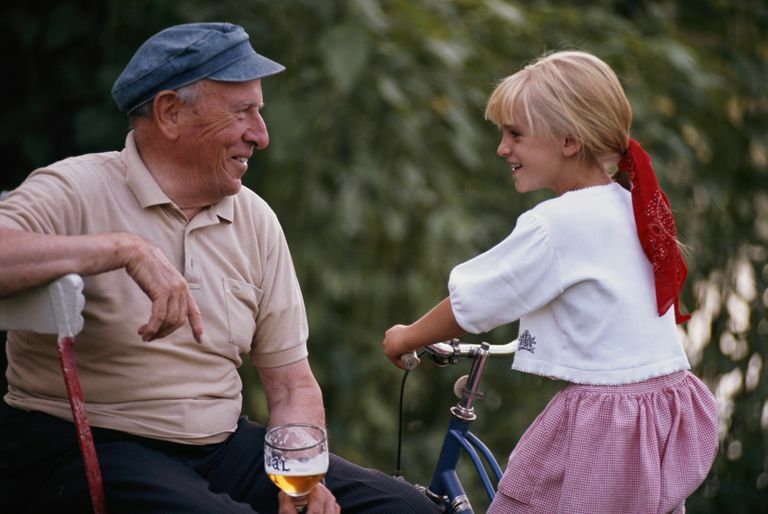 Children would not be likely to address a grandfather by this term. They would use instead daideó, approximately pronounced DADJ-yoh, or móraí, which is approximately pronounced MO-ree. Other Irish terms for grandfather include Athair mór (AH-her MORE), roughly meaning "great father," and Athair Críonna (AH-her KREE-un-na), roughly meaning "wise father." The formal term for a great-grandfather is sin-seanáthair. The Irish words for grandchildren are gariníon (gar-in-EE-in) for granddaughter and garmhac (gar-aWOK) for grandson. Grandmother in Irish is seanmháthair (shan-a-WAW-her), although that is the formal term, like grandfather, there are more loving, diminutive terms that are more popular and preferred in common speech. Irish names for grandparents have not been widely adopted by non-Irish, as some other grandparent names have been. This is probably due to the complexity of the spelling and pronunciation. In fact, most Irish children are English-speaking and call their grandfathers English names, such as grandpa, granddad, or pop. Granda is a popular version since it has a bit of Irish flavor and is easy to say. Although Irish is an official language of Ireland and of the European Union, only a minority of the Irish speak it today. This is due primarily to years of British rule in which use of the language was repressed. There are areas in Ireland, known as the Gaeltacht, in which the language is used for everyday speech. Those counties in Ireland that are part of the Gaeltacht include Donegal, Mayo, Galway, and Kerry. Over the past 100 years, the Irish language has been experiencing a revival. Although the use of Irish in rural areas, where it used to be common, is in decline, it is on the rise among well-educated urban professionals. The teaching of Irish has been mandated in public schools for many years, but now schools are appearing in which primary instruction is in Irish. Irish travel writer Manchán Magan set off to test the often-quoted (perhaps erroneous) statistic that a quarter of Irish people speak Irish. Magan's account of his experiment gives you a good sense of the use of the Irish language in Ireland. Irish men have the reputation of being fun-loving and easy-going, although they also have a fiery component to their character. Although loving, they are often not demonstrative. Although the Irish are widely regarded as having an aversion to authority, that does not extend to authority within the family, especially paternal and grandfatherly authority, which is expected to be respected. The Irish value independence. Rather than living with family, elderly Irish prefer living on their own. Although ties with extended family are valued, many Irish, especially men, dislike turning to family members for assistance. Modern Irish fathers and grandfathers are adjusting to changing times, a poll about the Irish family has revealed. Grandparents, including grandfathers, are the most popular child care providers in Ireland, stepping in 42 percent of the time. Have you just found out that you are going to be a grandfather? If so, you have something to decide along with your family, and that is, what will your grandchild call you? You can review a list of names for "grandfather" in other languages or cultures, or you can look at choices that are popular in the U.S.